Kris Howes designed Wordpress and Magento inline store with custom configurator. A good example of a collaborative project - I handled the Wordpress, Kris designed it, and a Magento development agency handled the Magento customisation. 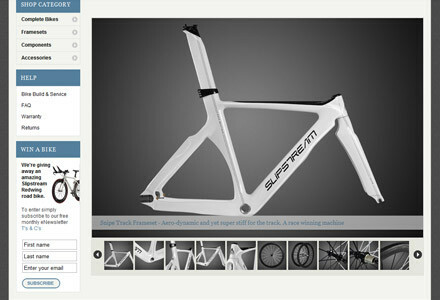 The Slipstream site is a combination of Magento & WordPress, but I only handled the WordPress side of things (the Magento site involved a very tricky configurator which really required a team of developers to complete). However, this is a good example of a job involving numerous different parties working well together to deliver the project. In this case it was Kris who was organising and managing the different parties along with the client Seb Horner.